The Berkeley Peace and Justice Commission will be meeting at the North Berkeley Senior Center, 1901 Hearst Avenue, Berkeley, CA, Workshop B on January 8, 2018 at 7 pm. On the agenda they have included a discussion with public comment regarding the Meiklejohn Civil Liberties Institute’s call that the Berkeley Peace and Justice Commission take action to stop the harassment of landless people by the City of Berkeley and that sanctioned encampments be allowed so that landless people can be treated with dignity. 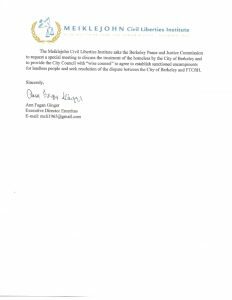 We ask everyone to join the Meiklejohn Civil Liberties Institute at the Berkeley Peace and Justice Commission meeting on January 8, 2018 to support the open letter by Ann Fagan Ginger below and to demand that the City of Berkeley fulfill the principles upon which the Berkeley Peace and Justice Commission was founded which is the respect of human rights for all people. Make your voice heard before that meeting. Sign the email petition below now! 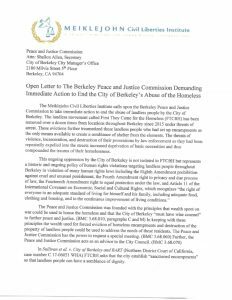 I support the call by the Meiklejohn Civil Liberties Institute that the Berkeley Peace and Justice Commission take immediate action to end the abuse of landless people by the City of Berkeley as set forth in the open letter by Ann Fagan Ginger below. The Meiklejohn Civil Liberties Institute calls upon the Berkeley Peace and Justice Commission to take immediate action to end the abuse of landless people by the City of Berkeley. The landless movement called First They Came for the Homeless (FTCftH) has been removed over a dozen times from locations throughout Berkeley since 2015 under threats of arrest. These evictions further traumatized these landless people who had set up encampments as the only means available to create a semblance of shelter from the elements. The threats of violence, incarceration, and destruction of their possessions by law enforcement as they had been repeatedly expelled into the streets increased deprivation of basic necessities and thus compounded the trauma of their homelessness. In Sullivan et al. v. City of Berkeley and BART (Northern District Court of California, case number C 17-06051 WHA) FTCftH asks that the city establish “sanctioned encampments” so that landless people can have a semblance of dignity. The Meiklejohn Civil Liberties Institute asks the Berkeley Peace and Justice Commission to request a special meeting to discuss the treatment of the homeless by the City of Berkeley and to provide the City Council with “wise counsel” to agree to establish sanctioned encampments for landless people and seek resolution of the dispute between the City of Berkeley and FTCftH.